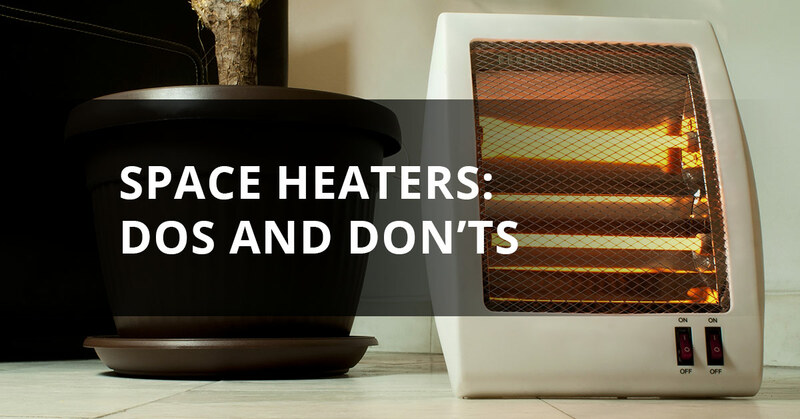 With the temperatures dropping, it’s the perfect time to go over the dos and don’ts of using space heaters in your home. Plug your space heater into an extension cord. Leave flammable objects, such as curtains, blankets, etc., near your space heater. Leave your space heater running while you are sleeping or away from your home. Allow your children or pets to play near space heaters or touch them. The exterior of your space heater can get very hot and could burn a child or pet. Plug your space heater in if the cord looks worn, cracked or damaged. Use a combustion space heater that is unvented inside your home. Place space heaters on dressers, tables or other places where they could fall off. Use your space heater to cook food, thaw pipes, dry clothes or warm your bedding. Plug your space heater into a wall outlet that has its own dedicated circuit. Make sure that there is a three-foot clearance area around all sides of your space heater at all times. Turn off and unplug your space heater when you aren’t using it, you go to sleep or you’re away. Keep all children and pets away from your space heater. Read warning labels and follow all installation and operation instructions from the manufacturer. Test all of your smoke detectors to make sure they are working before using your space heater. If you have a vented combustion space heater, get it inspected every year to ensure that it is well-vented. This is important for preventing carbon monoxide poisoning and other related risks. Place space heaters flat on the floor. Keep space heaters out of high traffic areas in your home. Now that you know the dos and don’ts of space heaters, you can stay warm, cozy and, most importantly, safe throughout the coldest months of the year. Please contact us if you have questions or concerns about space heater usage in your home. Contact our electrician in Cincinnati today!